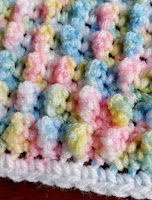 This crochet stitch is a variation of the Crunch Stitch. It produces an effect very similar to the Puff Stitch, Bobble Stitch, Popcorn Stitch, Raspberry Stitch, but is much simpler to produce. Sooo easy! The stitches you need to know are the chain st (ch), single crochet (sc) and treble (tr). Every other stitch in one row is a single crochet (sc) followed by a treble (tr) stitch, and every other row is in single crochets (sc). Use any thickness of yarn and hook size to match the weight: depending on the project you have in mind. Work a chain in multiples of two. Into the first chain work 1 single crochet (sc). Then work the rest of the chain length in single crochets (sc). (This produces a sturdy baseline to work on). Chain 1 (ch1) and turn your work. *Single crochet (sc) into the first stitch. One treble (tr) into the next stitch*. Repeat the stitch sequence ** to the end of the row ending with 1sc into the last stitch. 1ch and turn your work. Work sc's into all of the stitches to the end of the row. Rows 2 & 3 form the pattern and are to be repeated to the length of the project you desire. When you reach the length of work you desire finish off with row 3 (sc). This will balance out with the beginning row. 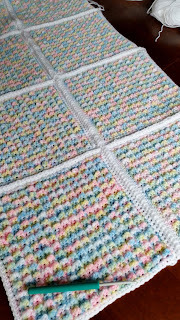 With the sc stiches at the beginning and end of each row you will have a good base to work a border around if so desired. As you work the treble stitches alongside the single crochet stitches a small 'Bubble' will form to the back of the work. This is correct. 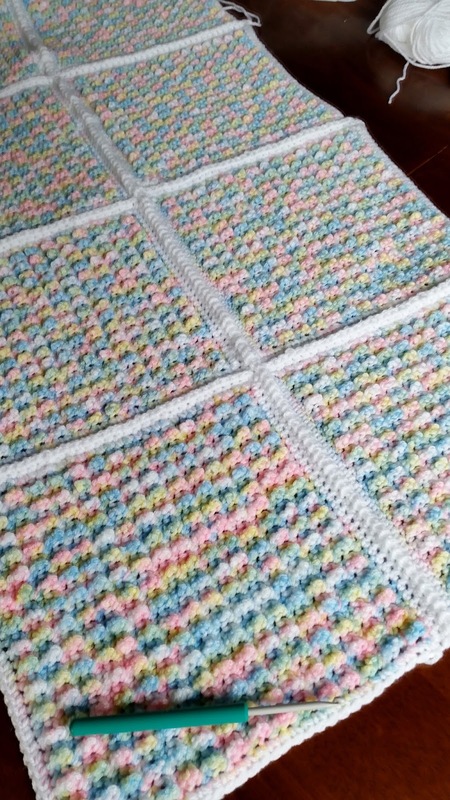 By ensuring you work a single crochet stitch at the beginning and end of each row your bubbles will lie on top of one and other creating a very uniform pattern. Reminds me of bubble wrap. You just want to pop them! My blanket is for a crib size. I have used DK yarn and 4.00mm hook. I chained 34 resulting in 16 bubbles in the bubble row and I worked 15 bubble rows plus ended with a sc row. I worked a contrasting border of sc. Working 3 sc into the corners. 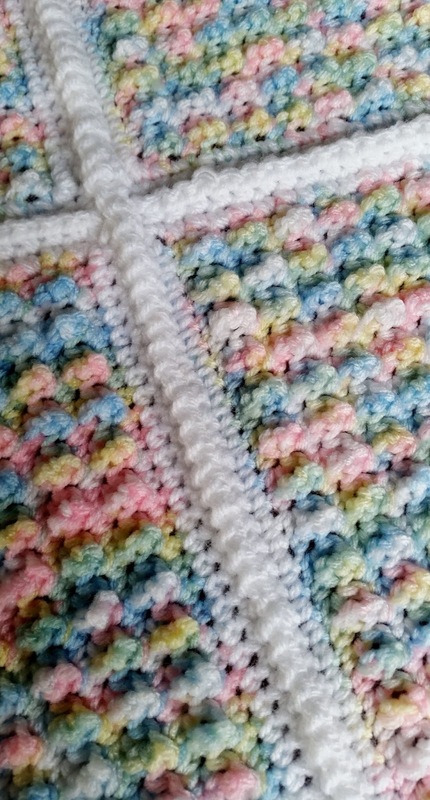 My blanket consists of 12 eight inch squares before adding the border. Once all joined a final sc border in contrasting yarn. 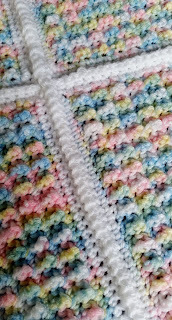 I joined the squares using a single crochet method that I reconfigured to what I prefer. I prefer my joins to be central and remain upright. The method demonstrated in the 2nd link is a flat sc join, and tends to lean to one side. In the 1st link I have demonstrated my version of SC joining which I much prefer. It adds dimension and ensures the ridge formed lies central and not to one side. I will put links to both methods below. 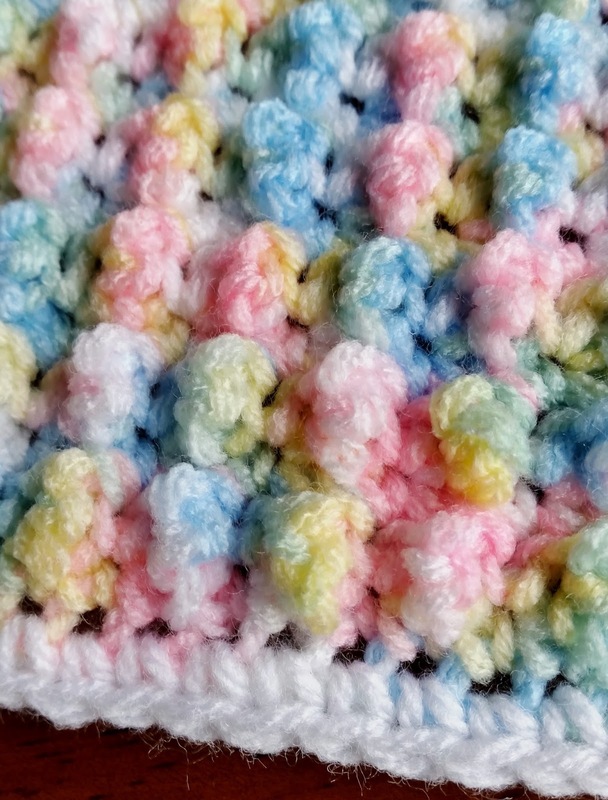 I hope this post will help those that are a little challenged with the regular Bobble/Puff stitch. This method is so much easier and fast to work up. I hope you have fun with it. If you just want to view the Dimensional SC Join then fast forward the video to 5.05 mins.